Job seekers can send in their SONIC Drive In application for a chance to work for one of the biggest drive-in fast-food restaurant chains in America. Founded back in 1959, the company has grown tremendously in its many years of experience. At the moment, there are more than 3,500 SONIC Drive In locations available in the US. SONIC Drive-In restaurants are open 24/7. Customers can use the store finder feature on the company’s official site to find the restaurant locations in their area. The customer service department can be reached at (866) OK-SONIC (866-657-6642). Customers can talk to the company representatives about their experience at the SONIC Drive-In restaurants. The company headquarters address is as follows: SONIC Corporate Headquarters, 300 Johnny Bench Dr., Oklahoma City, OK 73104,Phone Number: (405) 225-5000. The minimum SONIC hiring age is 16. All candidates for employment are required to be above the age limit to be eligible for the application process. Job seekers must submit their SONIC Drive In applications online through the company’s online jobs portal to be considered for the available positions. They must choose between Drive-In and Corporate positions and then proceed to enter their current location to find the complete list of SONIC careers they can apply to. Please note that the SONIC jobs in the corporate sector are only available in Oklahoma. 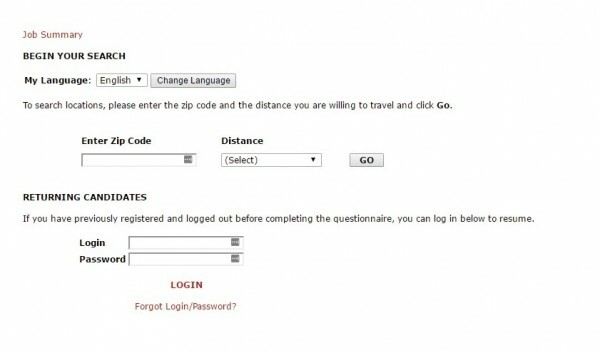 Candidates can search for available positions in their current location on the SONIC Drive In application portal. They must create a profile on the SONIC application portal and then they can select all the positions they want to apply for. We will present each section of the jobs and employment form so that candidates know what type of information they will be asked to provide. Candidates must register on the SONIC Drive In application portal. 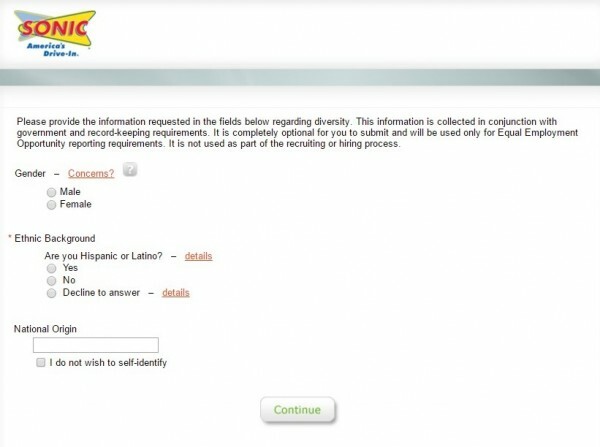 This is the first section of the SONIC application form, where candidates will be asked to provide details about their race, gender, and ethnicity. They will also be asked whether or not they have ever worked at SONIC before. Candidates must provide diversity information for the first section of the SONIC Drive In application form. Candidates must provide their resumes for this section of the SONIC Drive In application form. They can simply upload them to the online form from their computers. Candidates must add their resumes to the SONIC Drive In application form. For this section of the SONIC online application form, candidates must provide their complete contact details. They must mention the date they would be available to start work, the total amount of hours they would be able to work weekly and their desired salary. Lastly, candidates will have to answer three questions regarding their ability to comply with the main SONIC Drive In requirements. This section of the SONIC job application form requires candidates to provide information about the high-school education they have received. They can also include information about any additional program they might have attended additionally. 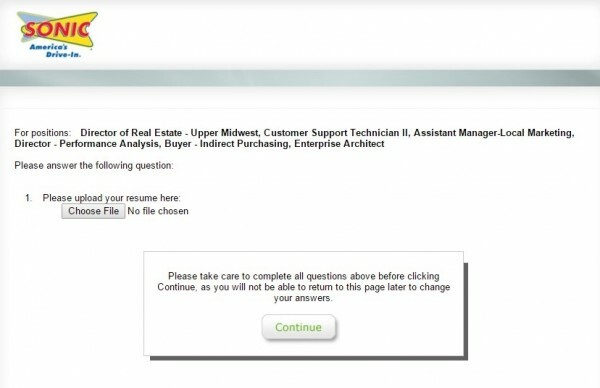 Candidates must provide details about their employment and education history for this section of the SONIC application from. Candidates are instructed to start with their most recent workplace for the Employment History section of the SONIC Drive In application form. They can then proceed to add information about other positions they might have had. They will have to add them in reverse chronological order. For this section of the SONIC Drive In application form, candidates must provide professional references. These will verify the information they have supplied to the previous sections of the form. Please note that it is mandatory that they provide three professional references. Candidates must provide professional references for the SONIC application form. This is the final section of the SONIC Drive In application form. Candidates will have to supply their electronic signature to validate the document. They will be asked to certify that all the information they have added is entirely true, to their best knowledge. Candidates will also be notified that their SONIC Drive In application is only valid for 60 days, after which it expires. This entails that if they have not received an answer from the company after 60 days, they must submit another application to be considered for SONIC employment. They can keep track of their SONIC application status on the online portal so that they know when they need to resend their employment form. SONIC Drive-In crew members are the backbone of the restaurant. They operate in the kitchen sector, as well as the restaurant, according to requirements. They will be trained to work in each sector at the beginning of their employment. This is the entry-level position available at SONIC Drive-In. As such, salaries begin a minimum wage. Then, as the employees gain experience in their employment, their hourly rates can be increased up to $9.00. The Assistant Manager is the second person in command in the SONIC Drive-In restaurants. He/She will work alongside the Restaurant Manager to supervise all the restaurant operations. They will coordinate the employees from each sector and they will ensure that they provide customers with the best possible customer experience. SONIC salaries for the Assistant Manager position range from $14,000 to $51,000 per year. Aside from this base salary, employees are entitled to performance benefits meant to repay the effort they put in every day. Healthcare SONIC Benefits: Medical, Dental, Vision, and Prescription Plans. Insurance SONIC Benefits: Life Insurance, Accidental Death and Dismemberment Insurance Plan. Retirement SONIC Benefits: 401(k) Plan. Financial SONIC Benefits: Competitive SONIC Salaries, Flexible Spending Accounts, Performance Bonuses. Paid Time Off SONIC Benefits: Vacation, Paid Holiday Time, Paid Absence Time. Special SONIC Benefits: SONIC Employee Discount, Car Allowance, Service Recognition Program, Tuition Assistance. 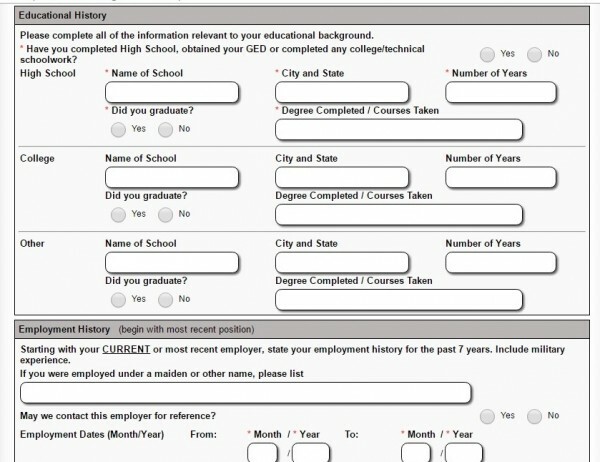 The SONIC Drive In application form is quite easy to fill out because it only requires candidates to provide basic information about their professional background. 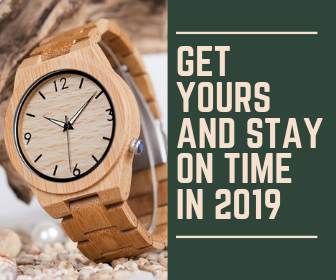 Provided that they have access to an updated version of their resumes, candidates should expect to spend approximately 20 minutes filling out the form. We recommend that they keep their resume close by when filling out the Sonica application because they will need to provide accurate contact details for themselves, their previous employers and their professional references. 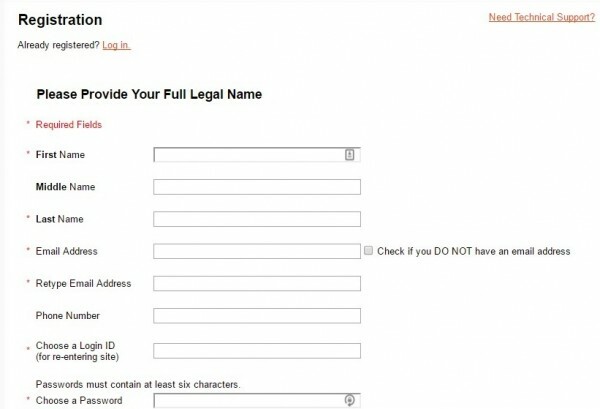 It is very important that they fill out all the sections of the form, even if they are not listed as mandatory. Candidates should provide as much information about themselves as possible to ensure that the SONIC hiring specialists have all the necessary details about them. 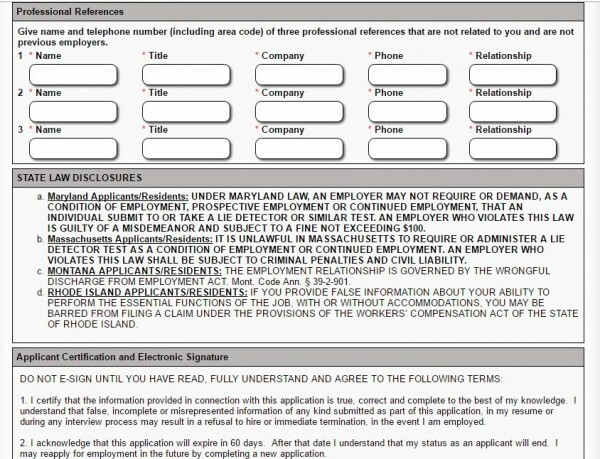 Another important aspect that job seekers should bear in mind when filling out the form is that they need to review the information they include. The form does not feature a separate section for this, so candidates should check their forms before submitting them to the SONIC hiring specialists. All the SONIC applications will be analyzed by the Human Resources Department. The top candidates will be chosen according to their skills and their ability to comply with the requirements of the jobs. Then they will be contacted by the SONIC hiring specialists to schedule job meetings. Candidates should expect between one and three interviews, depending on the career level and the department they have applied for. The SONIC hiring managers will then choose the best applicants for the positions. To prepare for the SONIC employment meetings, candidates should visit one of the SONIC Drive In locations. We recommend that they try the food and that they analyze the service flow at the restaurants. This could prove useful for their interview answers because they will be able to include relevant information. If they cannot visit the SONIC restaurants, they can use the company’s official site to read about the items featured in their menus and the special offers they provide. It is very important that candidates make it to the assigned interview location at least 10-15 minutes early. This is one of the details that will prove to be quite significant in their assessment. Candidates are advised to go through the following sample interview questions before their job meeting. They can try answering them because this will prepare them for the actual meeting. Why have you chosen to apply for SONIC employment? What do you think makes you a qualified candidate for the SONIC career you have chosen? On a scale of one to ten, how clean are you when you have to work quickly? What would you do if a co-worker told you about a mistake that you have made with a customer’s order?